It’s March and spring is just around the corner. As communities begin to thaw out, and regional farmers markets prepare to start offering their first spring crops, it’s a great time for farmers’ market managers to start planning their season. Farmers already have a lot to do, and market managers can play an important role in unifying and promoting the market. It’s no secret that farmers markets are becoming more and more popular. According to the USDA, as of mid-2011, there were 7,175 farmers markets operating across the US. This is an increase of 17% from 2010. A new local food system is growing, but it needs a boost of more robust marketing and promotion to compete with the industrial food system. Many market managers come to the job through a love of food and farming and a desire to be part of a new food movement. This is a great call to action, yet to take promoting local food to the next level, managers need to take a page from the marketing and PR units of established companies. To pull in shoppers and create buzz you can’t just be earnest — you have to be fun. We explain our philosophy of promotion to new clients as hosting a party. We don’t push a product or service at people. Instead we cultivate an atmosphere around the product or service that makes it something people want to be a part of. Inviting people to be part of something allows them take ownership and builds loyalty. A market manager is essentially a host of the market. Treat the market like your party. Welcome your guests. Make introductions between people who should know each other. Keep an eye on who’s getting along and who’s looking left out. Then invite more people. Most farmers markets have a table or kiosk where market goers can find a variety of local information. Some markets sell produce bags, feature recipes or information on regional tours, classes or places of interest. While that is fine, honestly it’s the bare minimum. Market managers should make this the hub of information for both vendors and the public. Give the customers a place to go for reliable information for the days events or specials as well as what to look for in the future, thus giving customers something to look forward to. This is also a good place to clearly communicate the mission statement of the market along with its history. Consumers want to know the back-story of their food community and market too. Start a countdown sign for a particularly popular item, especially at the beginning of the season when every new crop is eagerly anticipated. Advance notice helps build anticipation and buzz. Giving a heads-up about the end of a season encourages people to buy now. We’ve said it once, and we’ll say it again: great things happen when you connect the dots. If there are chefs who regularly patronize the market, take it upon yourself to help promote that link. Call out a local farmer-chef spotlight of the week on a chalkboard. By having rotating “local spotlight” menu items, patrons can taste the product prepared by a professional, which in turn validates their decision to purchase the product as well. It’s a tie-in to the local community that can be maintained beyond the day of the market. By bringing together the chefs and the farmers, consumers have access to a greater connection to both. To keep the good feelings going past the “event” itself, start a binder for past menu spotlights, available at the information stand. Don’t be afraid to make your own connections with bloggers and local food writers. A good market manager can help spot trends, coordinate a story, and give a head’s up about what’s coming in or out of season. (For tips on how to set up and pitch a story see our DIY Press Savvy series.) It’s a great way to generate buzz for the market and a good skill for your resume. To be a good promoter, think beyond what is required to what kind of impact you can have. Be bold, grab attention, and whatever you do, make it fun. Farmers and chefs have a lot in common. They both work long, often uncomfortable hours. They both suffer the whims of weather, from ruined crops to cancelled reservations, and they both depend on delivering a stellar product and pleasing others for their livelihood. To make it in food — from the field to the kitchen — you need passion. To make it in the food business, you need communication. No one knows your crops like you do, but for chefs to step-up and incorporate your product into their culinary rotation, they need as much lead time as possible to plan. No chef would be excited to see a mountain of fava beans show up unexpected on their doorstep….even if they were the absolute freshest and PERFECT! Restaurants have a rhythm and, with a little lead time, they can make the proper staffing arrangements to tackle such a mountain of favas. In fact, given just a bit of lead-time, a chef can do all kinds of things that would highlight your harvest. (A special fava menu for the bounty you just laid upon the kitchen’s doorstep!) But they need to know what to expect as far in advance as possible. As a farmer, if you can work to sync your harvest with the rhythm and pace of the restaurant, it will make for a much easier working relationship. Work the schedule backwards. Start by asking what the peak volume days are for the restaurant, then how much time they need to prepare whatever it is you are bringing. This will give you a better understanding of what it will take for you to deliver, and what it will take for the chef to do something great with your product. Farmers are sitting on a ton of information about the food they grow. This is inspiring information for chefs! To show off your work to best effect in the dining room, chefs need to know more of what you know. The best way to transmit this knowledge to the chef, and then for the chef to pass it to the kitchen staff and wait staff and consumers, is to put it in writing. Nothing fancy is required. An organized email or a printed one-pager that’s delivered with your products will do the trick. The description from the seed catalog and a few lines about how they were grown would be fantastic. Beyond heirloom products, farmers often have heirloom knowledge. Chefs don’t like waste, and as they begin working with local and artisan production, they increasingly need to know how to pickle, preserve, butcher, and more. This is to keep the bounty working for them through the peak and into the menu long enough to actually use the complete harvest. Chefs are sensitive to what goes into raising food, and using everything to the fullest is how they honor and respect the production. That said, many cooks today lack the “old-school” education needed to properly execute these traditional preserving or preparation techniques. If there is something in your family’s past, or some bits of knowledge that have been passed on to you as a farmer or artisan food producer, ask the chef if they are interested in trying out your methods. It might bring a new dimension to your relationship. The more ways they have to use your product, the more they can buy from you. Chefs may want more than they know. They might want a common varietal because they don’t know what else is out there. Chefs have become accustomed to standard products because they’ve been cut off from the actual farmer or fisherman. Ideally, as the connections between farmers and chefs are solidified, they can become partners in experimentation, and partners in building strong, diverse food communities. Farmer hours and chef hours are very different. Come up with a mutually acceptable time to talk. This will make communicating much easier and more efficient for you both. Provide the chef with a volume estimate of what they can expect. You know your production inside and out, but don’t assume the chef intrinsically understands or can estimate how much he will receive. Remember, a restaurant kitchen is a very busy place with many moving parts. Even if told two weeks in advance how many cases of your special heirloom vegetables they can expect, chances are good that the chef will have forgotten the details of the case count. A gentle reminder will keep the communication flowing and eliminate surprises. When the connection between producer and chef is reestablished, great things happen. Take a look at Chef Richard Garcia at the 606 Congress, located in the Boston Waterfront Renaissance. It’s a big hotel, and he serves a lot of fish. After establishing a local relationship with a few fishermen, Chef Garcia has been able to move beyond stating exactly which fish is going to be on the menu. The fisherman will call or text him from the boat about what they’re catching. One day it could be haddock, the next day it might be sea robin. His waiters are all up to speed on the program and share the information willingly with the customers. His customers know that it will be the freshest fish that happened to land that day, and it will be from one of his local fishermen. The chef gets variety and the freshest fish available. The fishermen get a market for everything that lands in their net. By keeping each other in the communications loop, they manage each other’s expectations and needs for a mutually beneficial business relationship and a more sustainable local food system. Last week in our branding and marketing advice column for sustainability-minded food entrepreneurs, we kicked off our three-part series on DIY press savvy by providing advice on how to put together a story that will resonate with the media. This week’s column is all about how to get your story in front of the right reporters. So let’s begin with the pitch. While it’s perfectly acceptable to make a phone call to make your pitch, email is generally the best first approach. With email, you won’t catch someone at a bad moment, and you can craft your pitch without worrying about getting flustered mid-sentence or going off-topic. Long live the personalized note! The proliferation of media outlets and ways to obtain news has had one really wonderful effect on media relations — it’s made it all more personal. Blasting formal press releases to fax machines everywhere is less useful than ever. The press release is dead. Long live the personalized note! Not having a one-size-fits-all release means that you can target your email to reporters and editors based on the topics that they write about and the audience for their publication. It means more work for you upfront, but since there’s a greater possibility of making a connection, there is a higher rate of success. Don’t waste your subject line. This is your headline and what will get your email noticed and opened. Have a little fun. A popular reporter at a media outlet has an inbox full of dreary subject lines that he receives everyday. If you can name drop (a well-known chef, romantic origins), by all means do so. Celebrity sells. Cut to the chase. Keep things brief, or at least offer a brief summary of what you’re talking about up front, and then include more information as an FYI. If the reporter doesn’t know what you’re talking about until the third paragraph, he probably won’t read that far. If you’re story is complex, and you’d like to write up something that is more like a formal release, you can certainly do that. However, it’s still best to start your communication off with a personal note that tells the reporter why the story you are pitching is exciting. Sending your pitch to the appropriate reporter or publication is as important as assembling the elements of a good story. The most reliable way to know you that you are targeting the right person is to read the publications you want to get into, and pay attention to who writes about what. Sending a product pitch to the restaurant reviewer won’t get you anywhere. This is match-making. If you are unfamiliar with a particular publication, you can work backwards. Available on the publication’s web site, or in the first few pages of a print magazine, is the masthead. The masthead contains a listing of everyone who works at the publication along with their job titles. Typically it is organized by subject (food, travel, environment, business) so you can find the names of the editors and staff writers. Then search by their names to pull up their recent articles, and see what they’ve been writing about. With this information, you can determine to which reporter you should send your pitch. Just make sure that you don’t pitch two people at the same publication at the same time. Nobody wants to go to their boss with a great new story idea only to find out that their office rival has shown up with the same great idea. Don’t just target the top editors either. There is a lot of value in cultivating relationships all the way down the masthead. All editors, and even interns, are gathering new story ideas, and their youth and ambition can work to your advantage. Many times great coverage comes from a junior staffer, who passionately goes to bat for an idea. They want the best possible exposure for their idea (and possibly the writing credit) to advance their career, so they’ll fight for you and your story. Once you have the name of a reporter or editor to send your pitch to, you will still need to find his or her contact information. There are guides priced from hundreds to thousands of dollars that promise email addresses and phone numbers for editors and reporters. With a little persistence, though, you can now find all of this information via a Google search. Most business emails follow a formula (e.g. First.last@company.com), so once you’ve found one, you’ve found them all for that publication. If you enter enough likely formulas in a Google search, you’ll probably dig up the address without much trouble. You can also call the publication. They will usually give you the email address that you need or patch you through to whomever is working on the holiday gift-guide, for example. Freelance writers are easier to get ahold since they often maintain their own web sites. Another great place to find information is in a publication’s Media Kit, which typically provides details on demographics, circulation and key publication dates. It can usually be found on the publication’s web site at the bottom of the homepage. It will also list any themed issues or special sections that appear throughout the year, such as a “green” issue or a special section on local businesses or food trends that might be a good fit for your story. If you really want to dive into working with the media, Mediabistro is a resource that can help streamline your information gathering and teach you a lot about the industry. It’s the go-to jobs and news site for media and PR, and it’s where you can pick up information on new editors being hired and new publication launches. The “how to pitch” features provides you with lead times and interests for specific editors and publications as well as their contact information. Some of the content is free. Most is accessible with a subscription ($55 for a year). Follow up: Stuff gets lost. You won’t be considered a stalker for sending a follow-up email a few days after the first one. Even a third note is OK. Speed is really, really important: if a reporter calls or emails you, respond immediately. If they are on deadline and calling everyone they can think of, the first one to get back to them wins. Photos: If you have photos, say so. Having print-quality photos can sometimes make the difference between getting coverage or not. If possible, include a link to where the photos can be viewed online. Don’t send photos (or anything else) as attachments. Let reporters do their job: Telling the story through their media outlet is the reporter’s job, and you shouldn’t try to micromanage how they run with a story. Don’t ask to read and sign-off on a story before it runs. Beware of pay-to-play coverage: If the “editor” or “producer” starts talking about “sponsorship,” this is not real journalism. Move on. Be gracious: Once the article happens, even if it’s only a mention, send the reporter a little thank you note. Getting media coverage is exciting, but ultimately it’s what you make of it that counts. Tune in next week to find out how to get the most from your 15 minutes of fame. this piece was originally published January 26 in Seedstock, the blog for sustainable agriculture focusing on startups, entrepreneurship, technology, urban agriculture, news and research. This week in our branding and marketing advice column for sustainability-minded food entrepreneurs we kick off a three-part series on working with the media that will cover how to develop your story, how to make your approach to the right reporters, and finally how to leverage the coverage you receive. The media plays such a huge role in society that it often gets talked about as something abstract and impenetrable. Getting coverage is really not all that mysterious, and the priesthood of PR agents isn’t required. With a few pointers and “rules of the road,” you will have everything you need to be a great press agent for yourself. And you will have what no one else can give you — authenticity. Nobody can tell your story with more passion, or explore more facets of it, than you. Authenticity, passion and a well-structured story mean more than an address book full of media contacts. The biggest piece in learning to represent yourself well to the media is understanding what writers and editors need to build a story, and how you can help them put the pieces together. If you don’t consume much media, such as foodie-focused magazines, local restaurant reviews or newspaper food or environment sections, start now. Look at the stories you read with a critical eye. What are the elements that are strung together to form the narrative of the article? Reading relevant media sources will also help you get to know which writers are interested in what kinds of stories, so you can target your approach (more on that in Part Two). The first questions you need to be able to answer are: Why you? And why now? News needs to be, well, new. There needs to be something going on that can capture attention. If you’re new on the scene, you’ll need to introduce yourself and why you matter. If you’ve had some coverage before, you’ll need to give them a reason why you should have more. “I’m a beet farmer, and beets are really yummy” is not news. Now we’re talking. Your beets aren’t just beets; they’re part of something going on, a trend. If you can’t line up the pieces like this now, don’t worry. We’ll walk you through some ideas of how you can make yourself part of a story. To create a pitch that you can approach the media with, you have to line up the elements of their article. The more complete your narrative or outline is when you present it, the more likely it is that someone will pick it up. If you’re looking for video coverage this is even more important. They will literally want you to paint a visual picture of what the story will look like — where they can shoot, who will appear on camera. If you have a big sunny kitchen to shoot something cooking or a picture-perfect barn, let them know. Get personal. You don’t have to unpack your full life story or innermost thoughts, but give your pitch a personal touch that will help the author flesh out an article. This speaks to the ultimate truth that people are interested in people. Even in coverage of storms and technological innovations, a general interest article will focus in on the people affected, not the wind forces or mechanics. Are you a career changer with a back-story very different from what you’re doing now? Are you farming land your family has farmed for one hundred years? Do you specialize in heirloom seeds that reflect your heritage or have a special connection to you? Perhaps you learned about them from your time in the Peace Corps or in a restaurant in which you cooked. One of the reasons people like supporting artisans and farmers is because they can feel connected on a human scale. Mentioning a few little details about yourself helps strengthen this connection. Jump on a train in motion. Taking advantage of existing momentum and getting coverage as part of a trend is a lot easier than breathing life into a totally new topic. Look at what you do with trend-conscious eyes. Is there a new scientific report or news section story that relates to something you do? Is a certain kind of restaurant all the rage in your area and you supply several of them? Look around your community and reach out to others who could be part of the same story. One farm doing something is random, but three farms doing the same thing is a trend. Line up the potential players in the story when you pitch. Create your own “why now?” Events are a great answer to why something is deserving of coverage now. If you don’t have anything on the horizon, create something. This isn’t cheating. Organize a farm visit day to celebrate a harvest or talk to your chef customers about creating a special menu featuring produce from your farm. The restaurant might even have a PR firm on retainer that can pull the story together and bring you along with their efforts. Festivals or holidays, with the exception of ultra-competitive Thanksgiving and Christmas, are also great to tie your events to. Perhaps your region has a seasonal festival or fair. Do you produce something that is part of a traditional food dish, especially one that connects to an ethnic group in your area? That’s a story waiting to happen, and you might be able to get yourself mentioned as part of it. Being the first one to do something is always a good angle. If you have something new going on in your field, use it. If you’re really not doing anything new and different from your neighbors, you may want to start brainstorming what you might be able to create in order to generate a little flash. How do you make your pitch to the media once you’ve lined up the elements of a story? Tune in next Thursday. this piece was originally published January 20 in Seedstock, the blog for sustainable agriculture focusing on startups, entrepreneurship, technology, urban agriculture, news and research. Every year thousands of new and established producers looking for a slice of the American retail market throw down some big bucks in summer or winter and exhibit at the NASFT Fancy Food Show, which ran this past week in San Francisco. Because of the costs of participation (booths start at $3,440, plus transportation to the show, materials, signage, staffing and samples) it skews towards large producers. As a small, farm-based producer, it would be very difficult to recoup your costs. And when you participate in a show, you join the market noise. Getting a shop onboard with your authentic product and story is better done one-on-one. You can talk to the retail buyers that are right for you without meeting them at a show. A little detective work can yield a better, more targeted list. Here’s how. Go to the web sites of other products you admire, and that are of comparable price and quality, and check out their “where to buy” section. That’s your starter list. Look at the Edible Communities advertisers. You can find them in your local print edition or on the web sites of other regional editions. The shops that advertise here are often the kinds of shops that are looking for farm-sourced, artisan products. If your product has seasonal appeal, start way in advance. If holiday sales are what you want, start reaching out in early May. Depending on the size of the shop, they may tell you to try back in a few months, but then you’ll know their schedule and you’ll have the correct contact information in hand. While exhibiting at the show isn’t a good value for small producers, it’s still a good place to watch for trends and newcomers. We walked every aisle looking for glimmers of authenticity, so you didn’t have to. Below are a few of our finds. American artisan cheese was well represented with familiar names like Coach Farm, Vermont Butter & Cheese Creamery, and Cypress Grove Cheve in attendance. The best story here is that great American cheese-making is no longer novel, even at a mainstream show like this one. The bulk of the show is long-shelf-life packaged goods. A few years ago, you couldn’t turn around without hearing about a new pickle company, but this year the field was spare. There were a few good examples of preserves from both east and west, however. Oregon Growers and Shippers has developed into a really impressive line of jams, butter, honeys and fruit pates that bring together the bounty of the Hood River Valley and surroundings in flavor combinations that give a sense of place, like cherry zinfandel and pear hazelnut. They’re a good example of an artisan and farmers partnership, and they market their farm-sourced story well. As an endorsement in their materials from a local orchardist explains: “Their success is our success.” Amen to that. Candy, cookies and other sweets were a big part of the show, and most on offer were cheap, industrial versions of familiar items. That made goat milk caramel from Fat Toad Farm in Vermont even more delightful. In addition to fresh cheese, they turn milk from their 64-head goat herd into jarred caramel sauces, both unexpected and delicious. Their packaging isn’t flashy but shows how a few thoughtful details can create a distinct look without breaking the bank. Their logo, an image of a fat toad that looks like a children’s book illustration, and touches like burlap gift bags printed with a line drawing of a jar, feel whimsical and farm-inspired without being folksy. Well-warn paths aren’t the only way to go. Sometimes it pays to be a pioneer. We wrote about Bourbon Barrel Foods in the context of building American regional food identities, and they were at the show in a category all their own with their Kentucky soy sauce. The most exciting thing that we’d love to see more of is high-end vinegar. A lone example at the show was Gingras, an aged cider vinegar from Quebec. They don’t call out their farm connections nearly as much as they could, but Gingras is made from apples grown in their own orchards and aged in French oak barrels to develop the flavor. We’ve seen fruit vinegars on cocktail menus in Japan, and Gingras was sampling a rum-based cocktail during the show. Chefs know the value of specialty vinegars in cooking, and this is a trend that could spill over more to home kitchens. Mixologists are also getting media coverage and shaping trends of their own. Across the country, the shelves of specialty food stores are stocked with European and Asian products with very little from the US. For a producer, it’s a higher value product than juice without all the regulation hassle of alcohol. And its appearance on cocktail menus opens up branding possibilities and name recognition for producers. If you’ve got a pioneering spirit and excess produce, it’s time to start experimenting. Let authenticity and clear flavors (not quirkiness for its own sake) be your guide. this piece was originally published January 12 in Seedstock, the blog for sustainable agriculture focusing on startups, entrepreneurship, technology, urban agriculture, news and research. For a chef, finding farmers and ranchers with great, responsibly produced local products is getting easier all the time. But can you get what you want delivered? And what if you’re off the beaten path, or your needs aren’t consistent? We’ve gotten to a place where the mind (and the wallet) is willing, but the logistics are weak. We hear over and over that direct sales are best for farmers, but it’s not always such a great deal. There’s nothing free about trucking goods around and sitting in traffic, or spending your “day off” standing at a market. Middlemen have gotten a bad reputation from unfairly squeezing both sides of the equation, but there’s nothing inherently wrong with paying someone for the valuable services of transportation and coordination. “I think a lot of farms would benefit from somebody who would take over the distribution angle. One of the problems is that the more time the farmer is out delivering to me, the less time he is on the farm,” says Rick. New, alternative delivery models are happening. Polyface Farm in Virginia has created Metropolitan Buying Clubs. Drop-off sites within four hours of the farm, often at a home, are put on a weekly schedule. Orders can vary each week, but to qualify for drop-off, each site must maintain a $1,000 weekly sales average to make the arrangement a good investment for the farm. The cost of delivery to the Buying Club consumers is a flat 28 cents per pound, which covers the cost of the truck, the driver, and the administrative time. A similar model to the buying clubs, but without a set schedule, are food “hives” in France. La Ruche Qui Dit Oui (literally, ‘the hive that says “yes”’) is a business that helps set up “hives” or local businesses that serve as hubs for locally produced food. Once the “hive” has been created and meets local hygiene codes, farmers connect with members of the hive. There are no ongoing subscriptions, and the members come to collect their goods at the central “hive” or hub. The coordination is all done online. Thresholds are set by the producers, such as 100 kg of apples at a set price. When enough members have committed to buying apples, and the 100 kg threshold is met, then the transaction is completed. The farmer brings the apples to the hub, and members come to collect their orders. Chef Rick is working on a solution for his own restaurant. It’s a drop box system where other farmers can “drop” their produce off at a walk-in located at one of his suppliers, All Star Farms. Then the farmer, Marty Jacobson, would bring it all down to him at Bocanova. Each farm would invoice Bocanova, and the invoices would be delivered with the produce. The problem is getting all the parts coordinated so it actually can work on a schedule. Not just a boost for buyers and sellers, finding new ways to move products within urban-suburban-rural food sheds helps us reshape a product’s carbon footprint. Any way possible to spread the carbon load minimizes the footprint of any given product or person. It doesn’t make sense for one worker, in one car, to travel upwards of 20, 50 or 75 miles from an outlying exurb or rural area, then to have a delivery vehicle make a dedicated run to and from that same region to the same restaurant. Know someone working in the city that would like to make a little extra cash? Have restaurant wait staff that live out of town and would like to take on a little foraging? Maybe produce is the next great carpool partner. 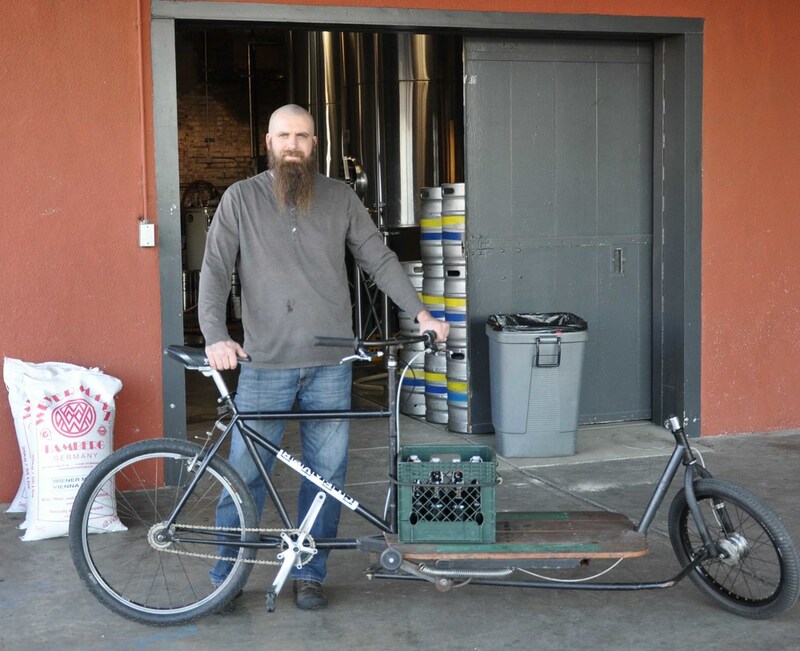 Adam Lamoreaux of Linden St. Brewery, preparing a deliveryFor those searching for how they can make a positive impact for the good food movement, we’ve got a job for you. Freelance forager, farm to kitchen runner — call it what you want, but we need more ways to connect growers to buyers. 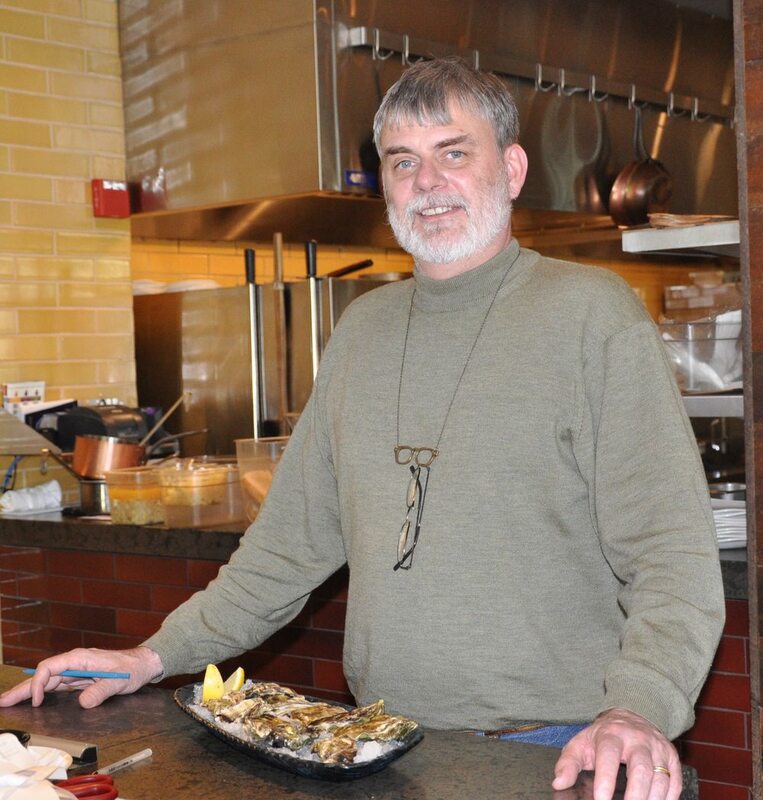 It may not sound very romantic, but it’s a missing link in the farm to table chain. Have you set up alternative delivery models for your farm or business? Tell us about it. Chef Rick couldn’t resist a shout-out to a few of his favorite sources. At Bocanova, he uses pork from Prather Ranch, eggs from Rolling Oaks up in the Sierra foothills, oysters from Drakes Bay Oyster Company (which is run by the Lunny’s, who also have very nice tasting grass-fed beef cattle that they raise on Lunny Farms), and fresh beer delivered daily by bicycle from Linden Street Brewery in Oakland. Polish is debuting a new marketing and branding advice column with Seedstock, a blog for sustainable agriculture focusing on startups, entrepreneurship, technology, urban agriculture, news and research. Today Seedstock introduces a new advice column for sustainability-minded food entrepreneurs who are seeking answers to questions about product branding, marketing, development and more. The column will run every Thursday for the next six weeks. The column’s authors, Alisha Lumea and Polly Legendre together possess over 30 years of experience working both for and as entrepreneurs to promote sustainable food systems. Each week they will select one or two of your questions to answer. What does my web site need to do for me? I want to sell my product to restaurants — how do I get started? I’d love to get some press, but how do I put together a press kit? Do I even need a press kit? What’s a press release supposed to say anyway? Do I need to trademark my company name? How can I afford that? The business channel I’m trying to sell my product through isn’t working — help! The goal is to make this column a place to get answers. So bring us your questions and your conundrums. Tell us a little about yourself, your business and where you are. You can submit your questions via email, facebook or Twitter.